Fill a stockpot or large sauce pan with water and bring to a boil. Cut each bell pepper in half vertically through the stem end so you have two boats from one pepper. Remove the seeds and veins from the peppers. Once the water is boiling, add the pepper halves and cook for 4-5 minutes, till just tender. Carefully remove the peppers from the water and drain on paper towels. Set aside to cool. In a large skillet, over medium high heat, melt the butter and add the chopped onions. Sauté onions until translucent, about 5-7 minutes. Then add the cooked chicken to the onions and stir to combine. Add chili powder, garlic, paprika, cumin and salt to the chicken and cook for another minute. Add the tomato sauce and stock to the chicken and stir to combine. Add the corn, diced poblano and zucchini to the chicken mixture and cook over medium-low heat for about 7-10 minutes stirring often until zucchini is fork tender. Gently stir the rice and beans into the chicken mixture. Taste the chicken mixture and season with salt and pepper as desired. Take the bell pepper boats, lightly salt and pepper the inside of the cavity and fill with the chicken mixture. Divide the chicken mixture evenly between the bell pepper halves, heaping them up if needed. 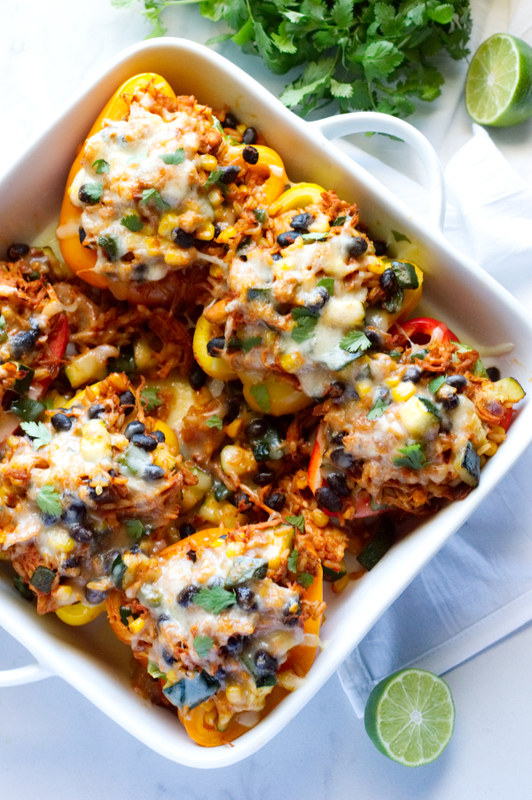 Place the stuffed peppers in a greased casserole. Top the peppers with cheese and bake at 400 degrees for about 20 minutes. Serve immediately topped with sour cream, avocado and chopped cilantro.